The book comprises 19 chapters, preceded by a Preface, and followed by 6 Appendices, Bibliography and Index. This is an excellent book on the subject. This book presents an integrated approach to performance of products over the entire life cycle activities such as design, manufacturing, testing, maintaining and disposing of products. The reliability development program is expanded from its earlier limited scope to include attributes of quality, reliability, maintainability, safety and customer satisfaction including, overall product cost and also how to manage them. This, as the authors emphasize, has become essential in Twenty-first Century as the users have become more conscious of the requirements of these attributes of performance over time in products and services and it is time that a book like this discusses them in one volume. The authors of this book are both mechanical engineering professors and are well-known and accomplished reliability engineers with considerable research and industrial experience. They have written books on reliability earlier also which have been acclaimed widely and become landmarks. Therefore, they bring the best of the two worlds of theory and practice of reliability engineering and management. Besides providing an excellent coverage of the conventional topics under reliability engineering, the discussion of Design for Six Sigma, Root Cause Analysis, Health Monitoring and Prognostics and Warranty Analysis adds to the value of the book. 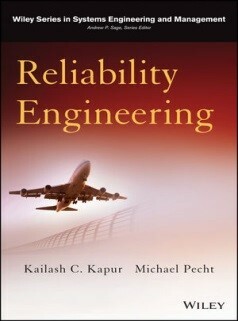 In fact the book covers the entire spectrum of topics that are essential for a person desirous of pursing reliability engineering as a career and also to a reliability practitioner. Audience for this book not is only restricted to post graduate and under graduate students who will find this book useful in pursuing a reliability course with set of problems given at the end of each chapter and the extensive bibliography included in the book, but also practicing reliability engineers and managers will benefit from the wealth of information available. Although, the reviewer feels that the book is an excellent and complete treatise on reliability engineering, a discussion of relevant aspects of sustainability in a book like this may have been appropriate, particularly, in light of need to resort to end of life treatment, remanufacturing, reuse and recycling to meet the challenges of Twenty-First Century. All of which are likely to affect the way products are being designed, manufactured, used and disposed of today.